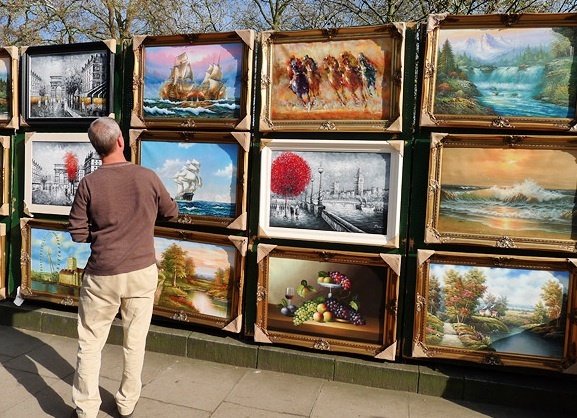 The art market at entry level, paintings for sale on the railings in Green Park, London. There is so much noise swirling around in the art market today that it is easy to become distracted. Endless PR from the auction houses about their record prices and endless drivel written by journalists who have no zero understanding of the art market. Such articles should be viewed as entertainment and theatre…nothing more. The best strategy for buying art is not that complicated in theory but it is surprisingly difficult to execute in practise. Top quality artworks should be acquired and held for the long-term. Buy fast and sell slowly. There are no bargains and anything that seems cheap is cheap for a very good reason. The price you pay is not so important as what you buy. But what to buy? Who knows what to buy? You are safe long-term if you buy quality irrespective of whether it is fashionable or not. But who knows what is real quality? Quality only becomes clear with the passage of time which is the only real art critic. With the passage of time it gradually becomes apparent what is special and what is not. Books are published, exhibitions organised, people have time to consider, and the average gradually gets revealed for what it is. But most people do not have the luxury of the passage of time and particularly not when considering recent art. So they rely on opinions of others and taste makers like the auction rooms and dealers and they look at recent prices to ascertain value. It is true that in the long-term price is a good indication of an artworks worth, as the best things become the most valuable, but in the short-term this is an unreliable indicator as it can be manipulated and/or driven by fashion. And as for the Russian art market? It is still to early to tell what effect the Ukraine situation is going to have but it is starting to feel like it is hurting the market even if just in terms of confidence. Restaurants are struggling to put good food on the tables in Moscow and westerners are worried about conducting business with those individuals or companies that have been sanctioned. Although the Ukrainian government is talking about trying to protect the cultural heritage in Eastern Ukraine there are reports of the Museum of History and Culture in Luhansk getting bombarded. Although much of the capital that enters the Russian art market is already outside of Russia there is a feeling that, until the situation improves, there is going to be some fallout. Already collectors are staring drive harder bargains feeling that they have less competition and the artwork is not going to be snatched by someone else if they hesitate. Sotheby’s on the other hand, under the probable influence of Dan Loeb who is now on the board (and presumably unhappy about the sinking shareprice), are shaking themselves up, cutting costs, and have announced that they have increased their maximum permissable amount of net lending for guarentees from US$300 to US$600 million. There is considerable hype regarding the activities of the new online platforms although whether collectors will really buy expensive masterpieces via these platforms remains to be seen. It is true that collectors are increasing prepared to buy a painting from a small image on their iPhone but this tends to be when they have the confidence that the artwork has been vetted by a leading auction room or trusted dealer. We shall see. The Year ahead in the Art Market, AMA, Paris, 28th Aug 2014. The 2014 TEFAF report states that “the global antiques and art market is almost back to the extraordinary heights of the pre-recession boom years”; with 17% growth in the first semester of 2014, totalling €5.22 billion in public auction sales of artworks. These figures could indicate a bubble in the art market, yet there seem to be many an argument as to why this exponential growth should continue for the coming year. Thierry Ehrmann, founder and president of Artprice, explained to the Agence France Press (AFP), that in the absence of a major geopolitical event, the art market’s good health should continue. With this in mind, we look ahead to the reawakening of the art world post-August and what is in store for this year. New waves or business as usual? As the Internet is defined as one of the key emerging markets for the year ahead it looks as though the prevalence of Post-War and contemporary art are the genres that are set to remain strong. Drawing conclusions from the data gathered over the last decade; 2013 saw an 11% rise in the value of Post-War and contemporary art, rendering it the largest sector of the market — accounting for 46% of the fine art auction market. These figures have been steadily increasing over the last decade correlating relatively equally to the volume of work on the market. The most expensive work of this year so far was Black Fire I by Barnett Newman, which sold for $84.2 million. Skate’s semi-annual report confirms that “data shows that since 2011, between 328 and 721 works featured in the Top 5,000 have been new entrants, with the first half of 2014 continuing the trend that sees new artists able to sell at the same level as more established artists.” Carlos Rivera’s tip-offs for the year to come are artists Will Boone, Wyatt Kahn, Aaron Garber Maikovska, Grear Patterson, Jonas Wood and Danh Vo. Whilst Thierry Ehrmann proclaims positive forecasts for the art market this year in the absence of a major geopolitical event, it must be noted that there are geopolitical events taking place in some localised markets that are bound to have a large impact upon the health of their art industry. AMA recently reported the bombing of the Museum of History and Culture of Luhansk, Ukraine, as fighting continues between pro-Russian separatists and Ukrainian forces. Ukraine’s Ministry of Culture has since tried to protect the country’s museums and has requested that the media avoids “emphasising objects of cultural heritage”, so as to prevent them from becoming targets. Iraq’s cultural heritage has also been endangered once again under the pressures of conflict; a country which saw its seven major museums fall victim to pillaging during the US assault on Bagdad in 2003, has seen a rise in illegally trafficked cultural goods. Whilst it is clear that the art market is not the only sector of the national economies of these countries to feel the strain of war, it is true that ripples can be felt elsewhere in the art market. These two case studies are relatively localised on the global scale of the art market yet it is important to note trends; for example Artprice cites that, “the first Gulf War in 1991 triggered a dismal slump in the art market.” It must be recognised that the turbulent political times we face could seep into the functioning art market; for example the heavy sanctions placed on the strong Russian art market and the cultural boycott movement against Israel. Furthermore, concerns have been raised about the future health of the art market following the drop of Sotheby’s share price of around $41 as of Friday 22 August, down from a high of $53 in January. Rivera tells AMA he believes that “the public is now in a manic phase fuelled by media attention, greed and delusion. Art dealers, advisors, auction houses and collectors call this a ‘new paradigm’ fuelled by a raised global wealth pedestal. Contemporary art valuations exceed any rational valuation […] The question is not if we are in a bubble, but rather when the bubble will burst.” Recent articles in The New York Times and Art Market Monitor also express fears that art-related companies are peaking. As for what lies ahead elsewhere in the art world, there are more than a couple of noteworthy openings: firstly the Fondation Louis Vuitton is due to launch in Paris’s Bois de Boulogne on 27 October 2014. A centre to promote contemporary artistic creation both in France and internationally, the Fondation Louis Vuitton building is designed by architect Frank Gehry and the collections and programmes will feature creative movements of the 20th and 21st centuries. The equally anticipated Louvre Abu Dhabi is due to open in 2015, the result of an intergovernmental accord signed in 2006, and will display 300 works loaned from the collections of 13 French museums. On US soil, the big opening of 2015 is The Broad museum, Los Angeles; a new contemporary art museum by philanthropists Eli and Edythe Broad which is to feature nearly 2000 works from The Broad Art Foundation and the Broads’ personal collections. Elsewhere, the Palestinian Museum is due to open in April 2015 in Birzeit, outside Ramallah. The project is funded by the Welfare Association — a London-based organisation of Palestinian business people and intellectuals; fundraising began in 1997 in commemoration of the 50th Anniversary of the Nakba. The museum is designed by Irish architecture firm Heneghan Peng. The National Gal­lery Singa­pore is also due to open in 2015 dis­play­ing South­east Asian art, includ­ing Singa­pore art, from the 19th cen­tury to present day. Two historical buildings — the City Hall and the former Supreme Court — will be refurbished and reopened as the National Gal­lery. Conversely, 2015 marks the end of an era for the Hayward Gallery, London, which will close its doors for two years for extensive renovations. Before the closure, however, the Hayward Gallery is to finish with a retrospective of Belgian artist Carsten Höller which will utilise the building itself given that the exhibition precedes the renovations. Other significant exhibitions for the coming year include Jeff Koons at the Louvre, Paris, in 2015 who is to present his large sculptures Balloon Rabbit, Balloon Swan and Balloon Monkey; and Sonia Delaunay at the Musée d’Art Moderne de la Ville de Paris, which after ending its stint in February 2015 will travel to Tate Modern in London, on display from 15 April to 9 August 2015. In Venice, the Guggenheim is to present Azimut/h; an exhibition dedicated to the gallery and eponymous review founded in 1959 by Piero Manzoni and Enrico Castellani, running from 20 September 2014 until 19 January 2015. So whilst the momentum of the art market doesn’t seem to be showing any signs of letting up, it is important to notice the small indicators that serve as reminders that headline record breaking sales don’t necessarily translate as actual revenue. Yet nevertheless, the market is seems to be modernising and adapting; in this fast-paced climate new exciting markets are emerging and younger artists are finding a platform to prosper.